Spider-Man’s far from home, because he’s in outer space. Geddit? 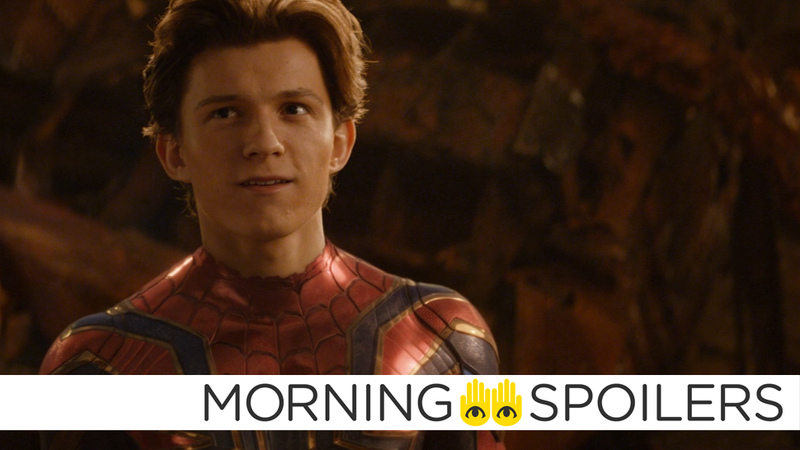 Don’t expect one Infinity War team up to make another appearance in Spider-Man: Far From Home. The new Child’s Play movie reboot won’t feature the classic voice of Chucky. There’s more casting rumors for DC Universe’s Titans and Doom Patrol shows. Plus, updates on the Doctor Who Christmas special, and what’s to come on Cloak and Dagger. Spoilers, away! Bloody-Disgusting reports neither series creator Don Mancini, producer David Kirschner, or actor Brad Dourif as the inimitable voice of Chucky will be involved in MGM’s upcoming reboot of Child’s Play. Instead, the trio will continue to develop both sequels and a television series at Universal set in the original film’s continuity. Speaking of dolls coming to life, THR reports Lasse Halstrom and Joe Johnston will share directorial credit on Disney’s new live-action adaptation of The Nutcracker. Despite filming in London, Kevin Feige confirmed Doctor Strange does not appear in the sequel to Spider-Man: Homecoming. I could be coy about it but no. An unprecedented global pandemic of a super strain of rabies has turned the majority of humankind into highly intelligent, streamlined killers known as ‘The Infected.’ One victim, Morgan (Matt Smith), who is asymptomatic and can communicate with the infected, leads the last survivors on a hunt for Patient Zero and a cure. Fandom Wire reports Seamus Dever is slated to play Raven’s demonic father, Trigon the Terrible. Doctor Who News reports an entry in series editor Edel McDonnell’s CV reveals he’ll working on a Christmas special this year with Wayne Yip, director of the season 10 episodes The Lie Of The Land and Empress Of Mars. A prequel set in the world of Syfy and Asylum’s #1 scripted hit zombie series Z Nation, Black Summer is as bad as the apocalypse gets. A worldwide drought and famine when most of the surviving population dies and turns zombie. As the remnants of humanity cling to existence, fan favorite Charles Garnett returns to send a new team on a desperate new mission: Retrieve a possibly untouched cache of the food substitute Soylent Z from Galveston, Texas. But when mission leader Israel Johnson and his small team arrive in Galveston, they’ll face a threat unlike anything ever seen before in the zombie genre. Den of Geek reports season three premieres July 20 on Sky One. In season three, DI Harry Clayton (Nesbitt) is in Hong Kong, looking for answers about his ‘lucky’ charm, where he comes up against some nasty underworld characters who have their eyes on more than just his bracelet. TV Line has a poster for season nine, debuting Rick’s new “hey I’m totally ready to peace out of this series” look. Talon (Jessica Green) struggles to command a murderous creature she has summoned. Garret (Jake Stormoen) and Janzo (Anand Desai Barochia) work to uncover the cause of the plaguing disease. Talon and Gwynn’s (Imogen Waterhouse) unlikely friendship grows as Talon continues to search for more of her family’s murderers. Michael Flynn, Robyn Malcolm, Andrew Howard and Philip Brodie also star. Jason Faller & Kynan Griffin wrote the episode, directed by Kurt Knight (#103). Original airdate 07/24/2018. As Clarke (Eliza Taylor) races to save Abby (Paige Turco), she learns more about the trials and tribulations Wonkru faced in the bunker, and the impossible decisions they were forced to make in the dark year. Bob Morley, Henry Ian Cusick, Marie Avgeropoulos, Lindsey Morgan, Richard Harmon, Chris Larkin and Tasya Teles also star. Alex Kalymnios directed the episode written by Heidi Cole McAdams (#511). Original airdate 7/24/2018. With Hope (Danielle Rose Russell) facing a life-threatening affliction and deteriorating quickly, Klaus (Joseph Morgan) travels to Mystic Falls to seek help from Caroline (guest star Candice King). Tasked with keeping Hope preoccupied in Mystic Falls, Elijah (Daniel Gillies) comes to a heartbreaking realization about his niece. Meanwhile, at the Salvatore School for the Young and Gifted, a run-in with Alaric Saltzman (guest star Matthew Davis) throws a wrench into Klaus’ plan. Charles Michael Davis also stars. Rudy Persico directed the episode written by Carina Adly MacKenzie & Julie Plec (#512). Original airdate 7/25/2018.